Whether wandering into the coffee aisle at the grocery store or popping into your local cafe, it seems that buying coffee can be an overwhelming task, especially when trying to find the perfect beans that suit your specific tastes. Companies have not been much help to the normal coffee drinker, especially when it comes to the way coffee is packaged and labeled. When you see coffees on our Roast Finder we have given many ways to look for your next selection allowing you to seek out your preference however you like. 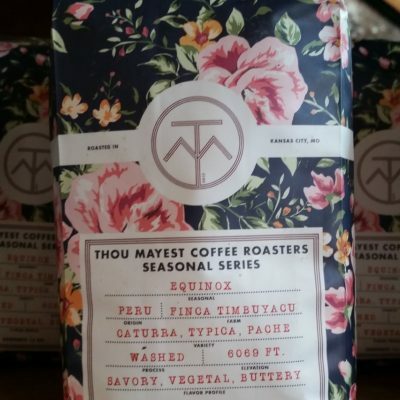 However, today I want to take a look at coffee labels more in depth, and hopefully help you know you are buying a bag of tasty coffee even if it isn’t based on our ratings. The first thing I would like to point out is that there is no rule for packaged retail coffee, other than the existing legal requirements which have more to do with consistent amounts and brand identification. Often times, the larger the company, the less they will put on the label. This is likely a strategy to eliminate confusion as well as to keep options open in regard to what is actually in the bag. You will find with smaller scale specialty coffee companies that there can be a huge amount of information about the coffee being sold, though this can also be incredibly confusing if you are unfamiliar with what that information refers to, or why it has any relevance at all. 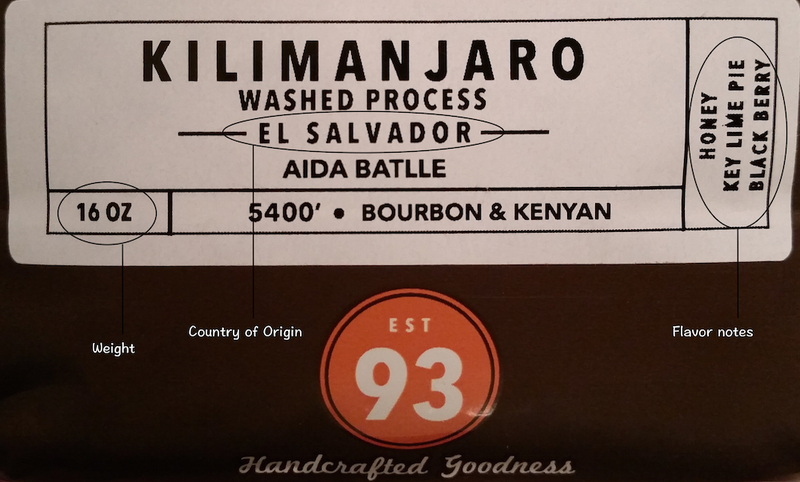 I am going to break apart some various aspects of coffee labels between two posts. First we will look at what I am calling “Common” information, and in the next post we will take a peek at information that is “Less Common” on a large scale, but becoming relevant in identifying your beans of choice. Each category of data will be explained briefly, and my intention is to help you focus on the data that will be most helpful for your needs. Brand name – This one is pretty obvious; the name of the brand or company that is selling the coffee. With smaller companies this is typically the roasting company name, and with larger entities (like McCafe) it is the branded name which may have outsourced the coffee roasting. A brand name is useful to identify as an association of trust with your senses. More well known (ie. Starbucks) is not necessarily better in this case. Rather you should explore and know the brands that you know make your mouth happy. 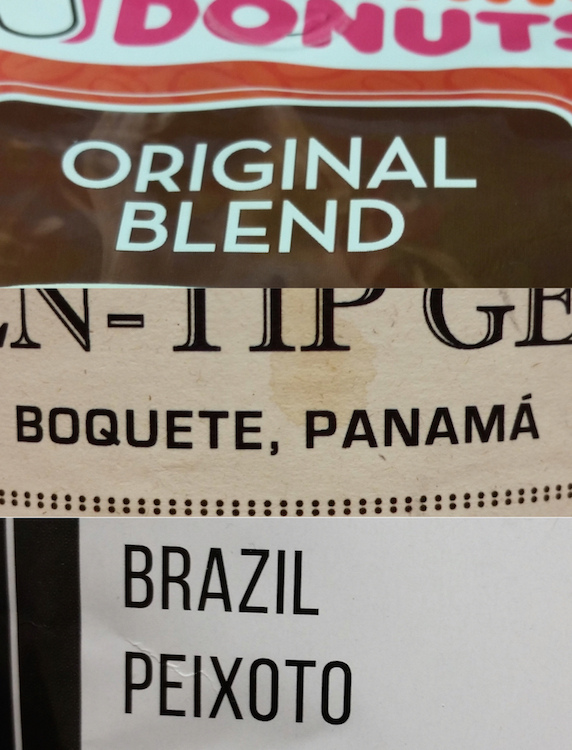 Country of Origin / Blend – This is a big identifier for coffee. The coffee industry has followed wine in many ways, and the origin country tells a lot. It is relatively easy to determine if a country of origin is present, as you will see the name of a coffee growing country somewhere. While the old flavor associations of a specific country’s coffee are not entirely accurate these days, they can still help guide you in a general direction with coffee buying. For example, Sumatran coffees traditionally tend to have an herbaceous, almost spicy flavor with a full body (this is one of the more popular origins among non coffee professionals). Conversely, blends are meant to be consistent flavor profiles (typically a combination of origins) that will satisfy your expectations year round. Generally, “single origin” coffees tend to be distinct and unique, while blends tend to be consistent and balanced in some way. Blend designations and country of origin should be easy to find. If your bag says neither it may well be a blend of origins. Whole Bean / Ground – Pretty self explanatory. If you have a good burr grinder at home you should be looking for whole bean coffee. If you don’t have one, you probably want to buy ground coffee. There is no question that grinding your beans fresh results in a more vibrant, aromatic, and distinct brew, so if you can grind fresh I always recommend doing so. Of course there is nothing like buying beans when you have no way to grind them, which is arguably worse than the flavor loss that comes with pre-ground coffee. Since particle size is key to grinding, a plastic bag and rolling pin is not the ideal way to grind coffee. Bag Size – Another labeling that is pretty obvious. Most all coffee is measured by weight when it is being sold, and the standards for quantity have been changing lately. In the US, 16oz (454g) was standard sizing for a long time, but the trend has become 12oz bags with a few companies selling 10, 8, and even 4oz at a time. It is always a good idea to double check the weight vs price and make sure you are getting the value you seek. With smaller specialty roasters, very small bag weights usually indicate very special beans that are prized for their exclusivity, flavor, or both. In these cases, the coffee is meant to be savored in small quantities rather than brewed as your morning “go juice”. Break it down to price per ounce (or gram) and make sure you are getting the value you seek. Roast Date – Many baristas will argue that the freshness of the roast date is one of the biggest keys to great coffee, and to an extent they are correct. The relevance of just how fresh your coffee is after roasting is also related to the manner in which it was packaged. If a roaster places the coffee in an unsealed brown bag it will degrade quickly, heat sealing in a foil-type bag preserves the coffee reasonably well for a 2-5 weeks, and the use of inert gas (such as nitrogen; mostly done by larger companies) in a heat sealed bag or canister may preserve the freshness of a coffee for months. The general rule of thumb is that fresher coffee is better, so it will never hurt to look for the roast date on the packaging. Also, many large companies use a coded stamp or a “best by” date rather than roasting date. In the case of a best by date, the specific roast date is usually either 6 months or 1 year prior to the expiration. Purpose (Drip vs Espresso) – Sometimes a coffee is labeled with its intended purpose in mind. Coffee in the US has traditionally been sold with drip, or filter, brewing in mind. It is common for companies to roast and select beans specifically for espresso preparation differently than the way they do for drip coffee. More recently, specialty companies have moved more toward a “uni-roast” which is meant to be used for either preparation. Luckily any coffee bean or blend can be used for either, so don’t feel weird if you prefer an “espresso” coffee as drip or vice versa. The recommendations from companies are a guide, but the more you trust the company the more you may want to heed their advice. 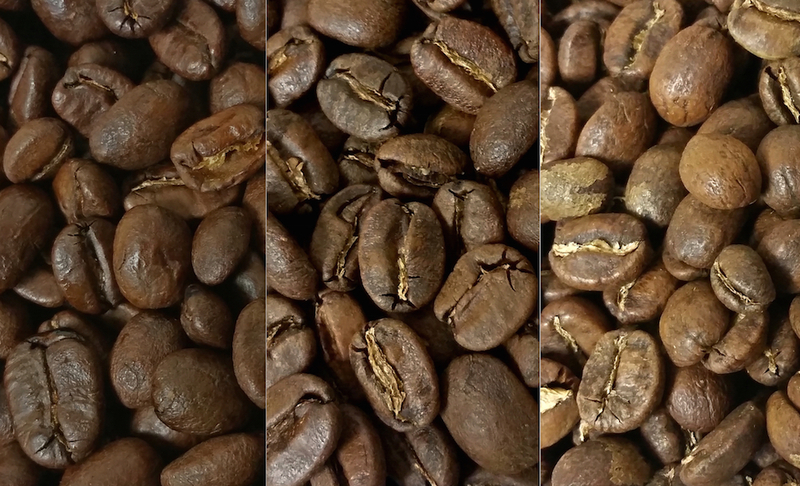 Roast Level – Roast level (light, medium, dark, or variations of these) is quite possibly the most misleading and inconsistent element of the coffee industry as a whole. A “dark” roast, for example, typically indicates a smoky, intense, bitter flavor, but these flavors can be imparted to a coffee to numerous levels. While the definition of roast level is vague at best, the interpretation can be even more confusing. One company’s light roast may be equivalent to another’s darkest offering. The scale seems to be unique to every company. For this reason I prefer to use roast level as a rough guide, and a last resort when it comes to making a purchase decision. Many modern specialty coffee companies have completely abandoned the roast level reference, simply encouraging their customers to trust that they will roast the coffee to the most appropriate level for that individual coffee or blend. Statistically most coffee drinkers prefer a medium roast, which is not surprising as that designation likely holds the largest range of roast characteristics in it. Flavor Notes -Flavor notes on a coffee label can range from approachable to inane. Sometimes these flavor descriptors are simple and understandable (ie. chocolate, nutty, fruity), but sometimes they become overwhelming and convoluted (ie. Hi-C Ecto Cooler, blackberry cobbler with cream, dough). This type of description has become popular with the emphasis of lightly roasted, single origin coffees which have distinctly different flavors from crop to crop, or even roast to roast. One consistent thing about coffee flavor notes is that most people don’t experience a coffee the way it is described on a bag. Not all flavor notes are worthless, however, and roasting companies do put in hard work to try and describe the coffee. It may come down to how well you know and trust the company you buy from. This is why we have provided two separate descriptions to every coffee we rate, one “professional” style with tons of flavor notes, and one “approachable” style with descriptive language to help understand what you will experience. At this point you may be wondering how the above information can help you buy a coffee. The label of a coffee bag is a useful tool when you understand it, so use the following tips to give yourself power over the confusion of purchase decisions! Familiarize yourself with brands you can trust. Remember that a bigger and more recognizable brand is likely mass produced and does not necessarily equate to better coffee. Your past experiences with coffee can help, though reading reviews of these brands can be helpful as well. Local and smaller operations tend to be putting in more effort toward their products, though the offerings have the potential to be inconsistent. Identify countries of origin that you enjoy the natural character of. Kenya, Ethiopia, Sumatra, Brazil, Colombia, etc all have their traditional flavor profiles so you have a better chance of finding what you like in a coffee. Blends tend to be closely associated with branding. If you like a specific blend, then you are buying into the brand/company more than a specific origin character. Always check to be sure you are buying for your purpose. Whole bean vs ground or espresso vs drip. If a bag doesn’t tell you whole bean or ground, simply pick it up and feel if it sounds/feels like a bag of gravel or a bag of sand. If you tend to prefer “espresso roasted” coffee, chances are that you want something a little darker roasted. In the industry we say “more developed” which simply means that the sugars were able to caramelize longer and deeper inside of the bean. Make sure you are getting a good value for your money. If you are not ok with paying a premium price for a premium product, seek out a less expensive offering. Conversely, if a bag of coffee is surprisingly cheap be cautious. It may contain inferior, old beans, or otherwise may be exploiting the people who grew and exported them. Take the roast level indication lightly. Remember that there is almost no consistency in how this is interpreted. If you are loyal to one or two brands you can probably get a feel for how their roasts differ. Another way to look at it is this: Small specialty/boutique coffee roasters tend to roast lighter than larger corporate brands, and their definitions of light vs dark reflect this. Light (Blonde??) roasted Starbucks is far darker than many specialty roasters define their darkest offerings. Take more heed of flavor notes that are simple and understandable rather than complicated and confusing. I have tasted “chocolate” and “nuts” in thousands of coffee samples, but have experienced “jackfruit cupcakes” in coffee exactly zero times in my career. Country of Origin, Bag weight, and tasting notes are identifiable. You will learn about the rest of the information on this label in the next post. A lot of information can be obtained just by reading the label. Again, there is more we will cover in Part 2. In this case there is a considerable amount we can understand by reading the label. 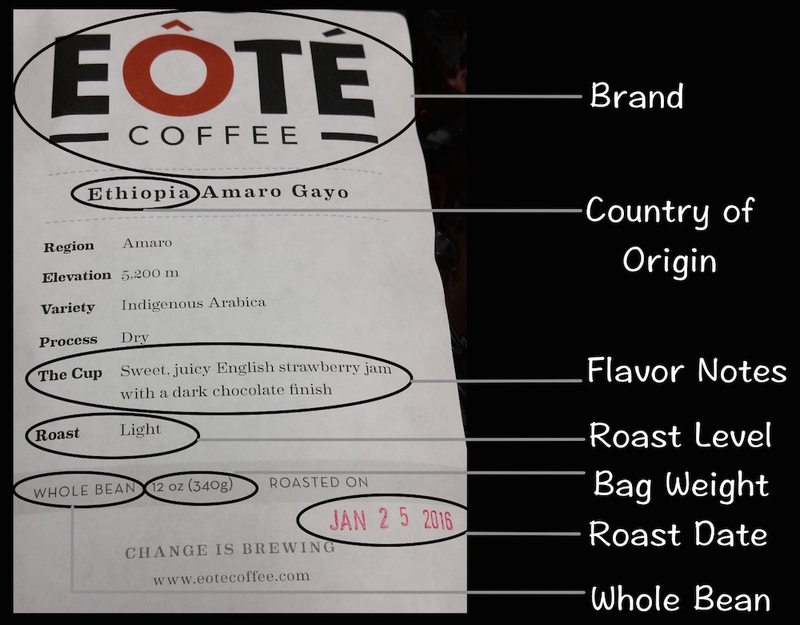 Eote Coffee has chosen to display a lot on one simple bag label. By using this information you can determine what you are getting pretty clearly, though you will likely need to base your purchase on past experience if you have expectations that need to be met in the flavor department. 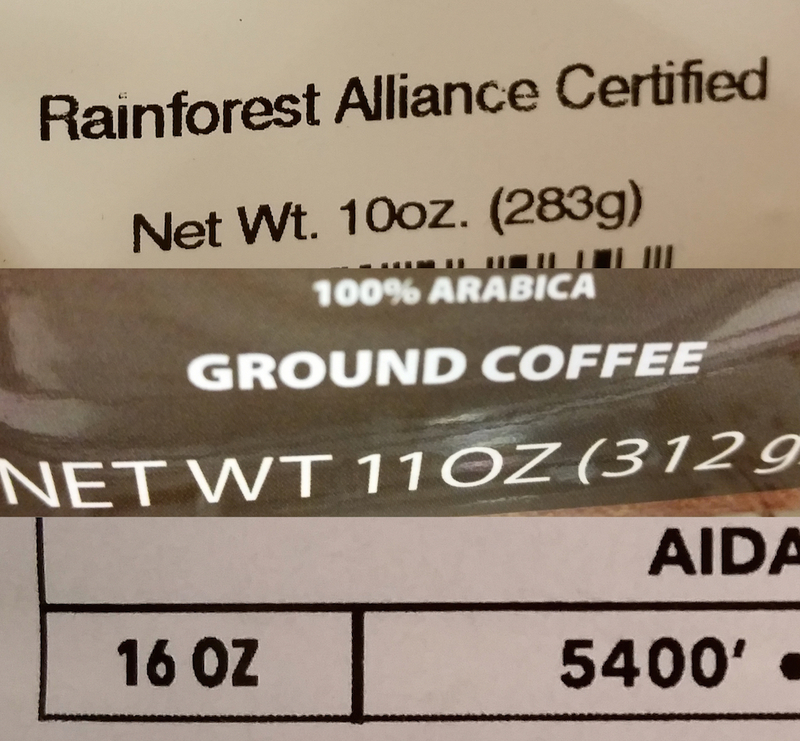 Despite the inconsistencies and confusion that surrounds coffee bag labels, I hope this information can be useful in sorting through the details when you are seeking your next coffee purchase. If you don’t work in the coffee industry the chances are that you only pay attention to the details of your coffee once or twice per week at most. If you put care into the products you are purchasing, the outcome will improve over time. Don’t forget to check out the next post that gets into the less common label information that can really give you insights into what in that bag.